Chicago real estate developer Laurance H. Freed, 54, the president of Joseph Freed & Associates LLC, was sentenced to three years in prison Monday August 21, 2017 for his connection to a fraud scheme connected to a $105 million line of credit secured through Chicago and suburban properties that included the Streets of Woodfield shopping center in Schaumburg. Freed’s attorney requested he serve his sentence at the minimum-security federal prison camp in Duluth, Minnesota, where has been ordered to report to prison January 9, 2018. Laurance H. Freed, 54, the president of Chicago-based Joseph Freed & Associates LLC, was convicted in 2016 on three counts of bank fraud, one count of mail fraud and four counts of making a false statement to a financial institution related to city and suburban developments, according to the U.S. attorney’s office for the Northern District of Illinois. The allegations against Freed involve actions that occurred from 2002 to 2010. Dallas-based Cypress Equities bought Streets of Woodfield from Joseph Freed & Associates in 2012 for $118 million. The fraud involved a 2006 line of credit with a consortium of banks that used tax increment financing (TIF) notes issued four years earlier by the city of Chicago for the redevelopment of a Goldblatt’s department store in the Uptown neighborhood. Joseph Freed & Associates had already committed the TIF note as collateral to Cole Taylor Bank and failed to disclose that in subsequent negotiations with creditors, including Bank of America and Cole Taylor. Streets of Woodfield is currently owned by Chicago-based Shopcore Properties. Joseph Freed and Associates became one of the largest privately owned shopping center developers in Chicagoland after Freed joined the family business in 1986. The 17-story CBS Broadcast Center at the northeast corner of Dearborn Street and Washington Street, Chicago. 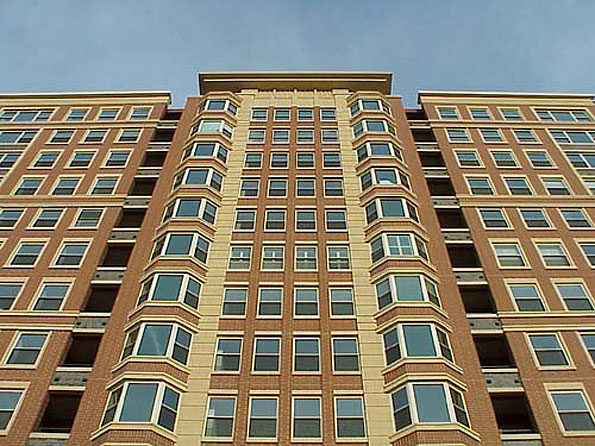 Arlington Town Square condominiums were also built by Joseph Freed and Associates, but the project was built before the period of the fraud allegations. Built in 1999, Arlington Town Square was known as the last Chicago area high rise built in the 20th Century. The Luxury condominiums inside the 14-story high rise were built by Joseph Freed and Associates (see also Joseph Freed Homes, LLC). Arlington Town Square, with the many small shops and theater nearby, were co-developed and owned by Golub and Company — a developer of high-quality commercial and multi-family residential properties in the United States and, increasingly, in the international arena through its affiliate Golub-Europe, L.L.C. Arlington Town Square condominiums in Arlington Heights on Evergreen Avenue.